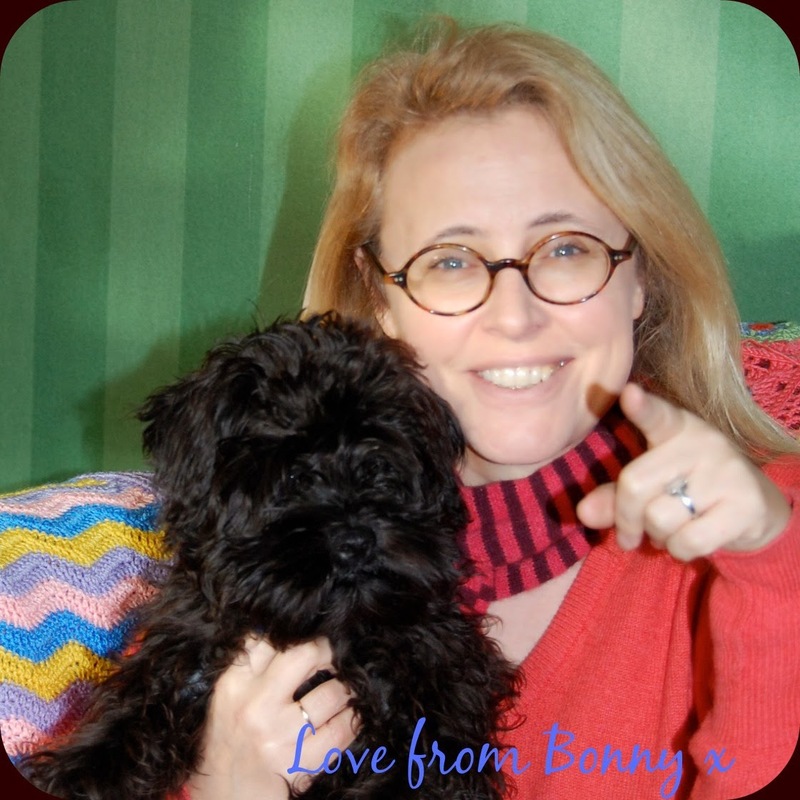 It's taken me the longest time to get this little cardigan off the needles - and then to get the pattern written up. I started work on it way, way back in May, and I really struggled to get it finished on time for Fibre East at the end of July. 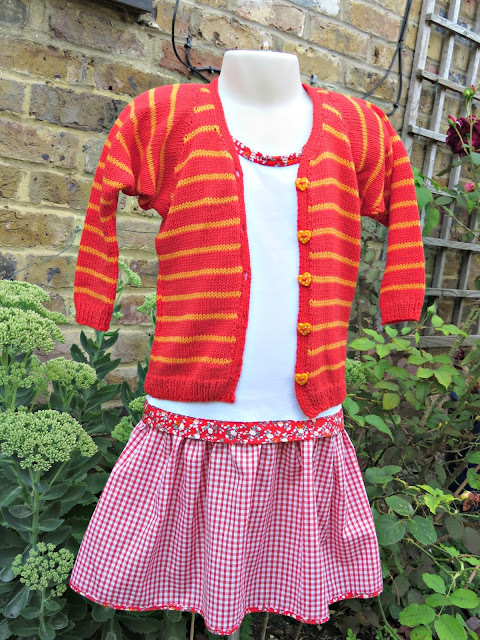 Here we are in the middle of September, and I'm only now managing to write up the pattern. There's been an awful lot of procrastination going on at this end. The truth is that I've spent all summer playing a form of tennis called Padel. I've had classes with the loveliest and most patient of instructors, and I've been out on court practising my shots every chance I've got. It's been more than slightly addictive. Anyone who came to visit me this summer has HAD to play Padel. No ifs no buts no coconuts - it's been down to the Padel court at every opportunity. And as a consequence all the patterns and knitting and stuff that normally occupies my time has ground to a halt. Anyway back to the project in hand. It's knit in our own-label Costa Brava Knitting 4 ply cotton, working in 2 colours: Post Box (red) and Tangerine (orange) using 3.25 mm needles (US size 3/ UK/Canadian size 10). It knits in stocking stitch to a tension of [23 stitches x 32 rows] on a 10 cm x 10 cm square. I've taken my sizing from Ralph Lauren size 3T, and knit the jumper to match. 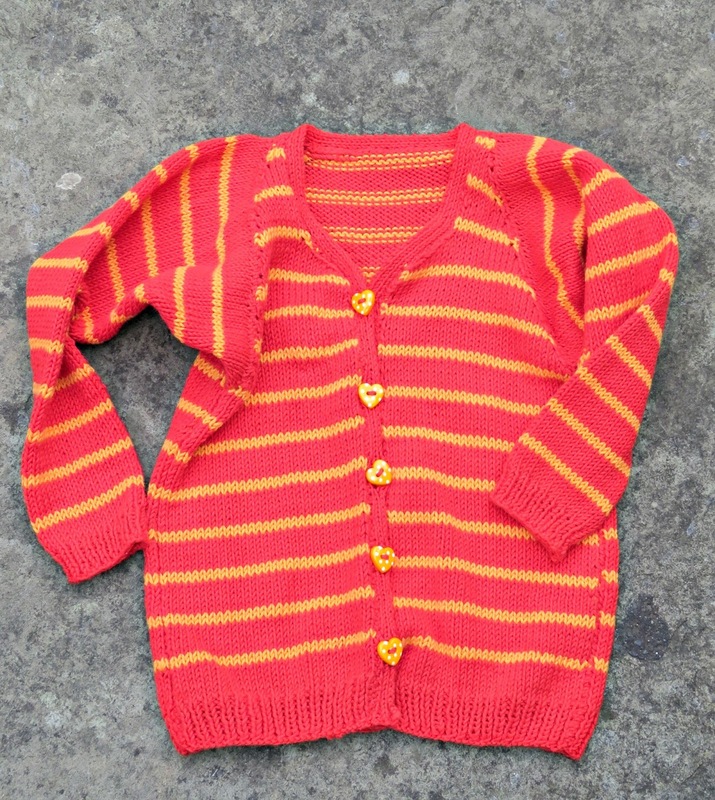 You'll need around 150 g of wool to knit this size - 100 g of Post Box and 50 g of Tangerine. Let's make a start with the back. I always like to start with the back because it's invariably the largest part that has to be knit. 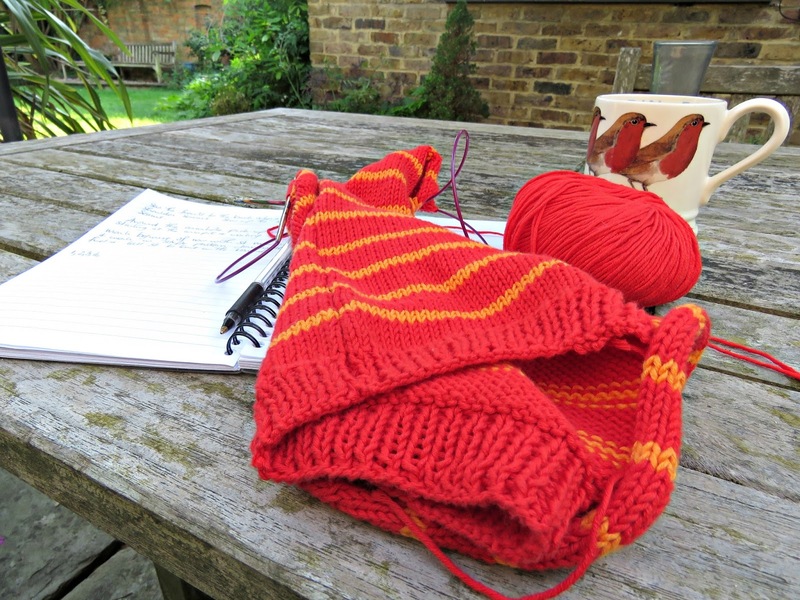 Cast on 70 stitches in the main colour - in this case Post Box (red), and knit in knit 1, purl 1 rib for 8 rows. 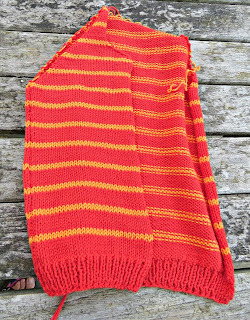 Carry on knitting in the striped pattern as follows: work 6 rows in main colour (Post Box) and then 2 rows in contrasting colour (Tangerine), working in stocking stitch i.e. knit right side rows and purl wrong side rows. Repeat until work measures 22cm in length (including the k1/p1 rib at the bottom). On the tension of my work I had to work a total of 8 repeats or 62 rows. Carry on working in the striped stocking stitch pattern, but casting off one stitch at the beginning of every row (both knit and purl) for the next 42 rows. You will finish this with 28 stitches on the needles. Purl 3, cast off 22 stitches and purl the final 3 stitches. Cast off the 3 live stitches from the last row. Rejoin the yarn on the other side of the central 22 cast-off stitches. Purl 1 row, and cast off the last remaining 3 stitches. 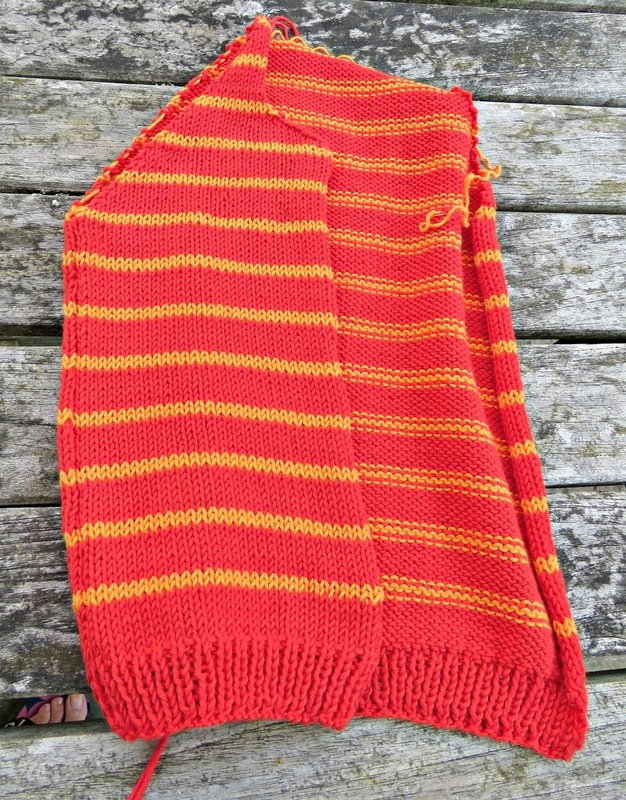 Cast on 32 stitches in the main colour - in this case Post Box (red), and knit in knit 1, purl 1 rib for 8 rows. Knit in striped pattern. Work 6 rows in main colour (Post Box) and then 2 rows in contrasting colour (Tangerine), working in stocking stitch i.e. knit right side rows and purl wrong side rows. Carry on working in the striped stocking stitch pattern, but casting off one stitch at the beginning of every knit row for the next 42 rows (i.e. on odd numbered rows from and including rows 63 to row 103 cast off 1 stitch). At the same time on purl (wrong side) row 82, cast off 3 stitches at the beginning of the row. On purl wrong side row 84, cast off 3 stitches at the beginning of the row. On purl wrong side row 86, cast off 2 stitches at the beginning of the row. Rows 105 and 105: work in pattern (there will be only 3 stitches remaining). Carry on working in the striped stocking stitch pattern, but casting off one stitch at the beginning of every purl row for the next 42 rows (i.e. on odd numbered rows from and including rows 64 to row 104 cast off 1 stitch). At the same time on knit (right side) row 83, cast off 3 stitches at the beginning of the row. On knit (right side) row 85, cast off 3 stitches at the beginning of the row. On knit (right side) row 87, cast off 2 stitches at the beginning of the row. Rows 105: work in pattern (there will be only 3 stitches remaining). The sleeves are knit from the top down to the cuff. 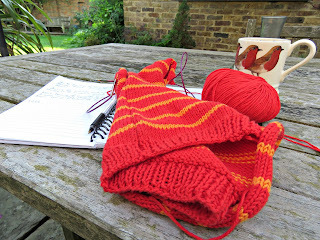 Cast on 98 stitches in the main colour - in this case Post Box (red), and knit in striped pattern for the first 2 rows. At the beginning of each of rows 3 to row 64 (inclusive) cast off 1 stitch and work in the striped stocking stitch pattern. Row 65 - 36 stitches - carry on knitting until the sleeve is the required length. In my case I knit for another 37 rows, finishing on row 102 for a sleeve that measured 30 cm in length. Change to 2.75 mm (US size 2/ UK/Canada size 12) needles and worked 6 rows in knit 1/ purl 1 rib. Sew the left front and the right front to the back along the side seams, and at the shoulders. Sew the sleeves into the resulting armholes. Cast on 5 stitches using 2.75 mm (US size 2/ UK/Canada size 12) needles and work in knit 1/ purl 1 rib. I sew it on as I go, knitting just a little ahead of where I'm joining the button band to the front of the cardigan. I sewed 5 sweet little buttons to the button band as I worked, positioning them so that they were evenly placed along the front edge of the cardigan. Carry on working along the back of the neck and down the other side. When you reach the point where you need a corresponding button hole on the other side: work 2 stitches in rib, cast off 1, work another 2 stitches in rib. Work 3 rows on the 2 live stitches. Then cut the wool and rejoin it on the other side of the cast-off stitch. Work 3 rows on the other 2 stitches. On the fourth row, work across to the gap formed by the cast-off stitch, cast on 1 stitch, and carry on across the gap working the remaining 2 stitches on the other side of the cast-off gap. Carry on working in rib until you reach the point where you need to insert another button hole. Repeat the steps above to create another button hole where required. When your button band is the correct length, cast off in rib, sew up and darn in your loose ends. Cast off, sew up and darn in all the loose ends.